One of the most important Grimshaw lines to originate from the original Grimshaw family tree was the “Pendle Forest” line, which was located at Heyhouses on Pendle Hill and in the area on the east side of the hill. The Pendle Forest Grimshaw line is junior to the earliest recorded Eccleshill and Clayton-le-Moors line (see companion webpage), and a connection has now been tentatively established. The Irish line of Grimshaws is derived from the Pendle Forest Line, as described on a companion webpage. Many thanks to Gerald Brewin, who familiarized the author with the Pendle Forest line and led a “field trip” to St. Anne’s Church and Heyhouses in May, 2000. Gerry has also provided a lot of other background material on Grimshaw family history. According to Trappes-Lomax2 (p. 16), the Pendle Hill branch of Grimshaws was started by Nicholas, younger brother of Henry, who was the 9th first-born in the Grimshaw line: “This Nicholas is stated in V.C.H. Lancs. 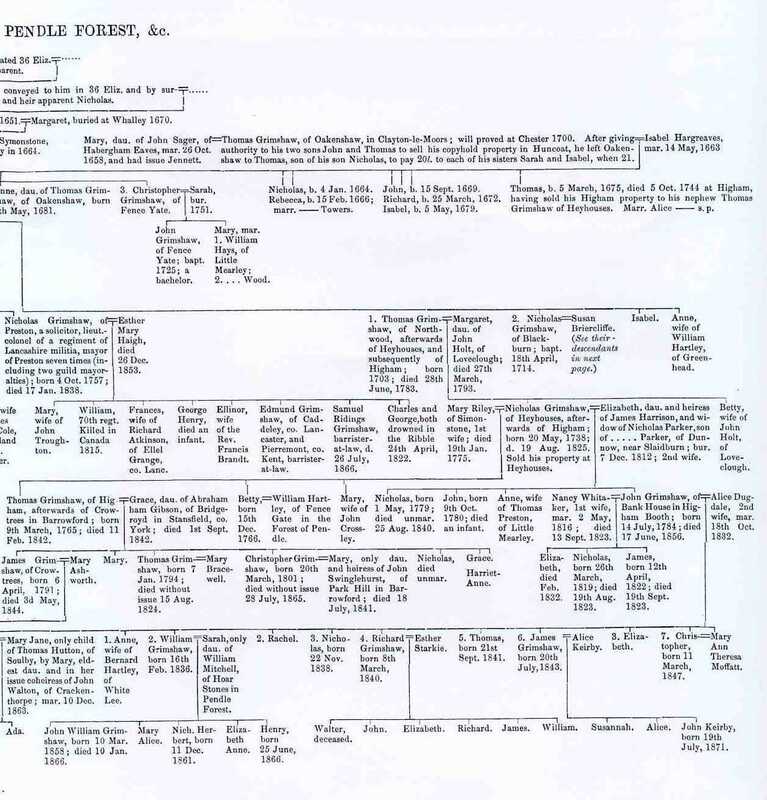 to have been progenitor of the Grimshaws in Pendle Forest.” The descendant chart for the Pendle Forest line, as presented in Whitaker1 (v. II, p. 276 ff. ), is shown below in two parts (left and right half, with overlap). The descendant chart of the Pendle Forest Grimshaws is shown in two parts below – first the left half and then the right half, with overlap. 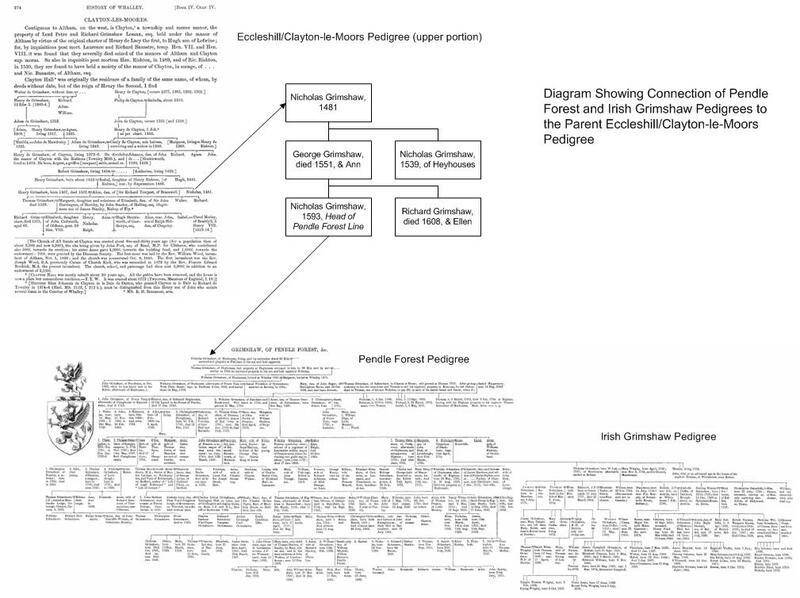 Note the similarities and differences of the coat of arms and crest shown in the descendant chart below for this family as compared to that of the originalGrimshaw family. The griffin is still depicted on the coat of arms, but the crest is also a griffin rather than two back-to-back lions heads. Also, the griffin is ducally crowned. The descendant chart shows Nicholas as living in 36 Eliz. (ca. 1588), when he surrendered property to his son. A look at Whitaker’s descendant chart for the earliest Grimshaw line shows a Nicholas as the younger brother of Henry and with the date 1481. The probable connection of these two Nicholas Grimshaws is discussed further down on this webpage. An interesting feature of this line is the marriage of Nicholas Grimshaw, in the fifth generation of the Pendle Forest line, to his distant relative, Anne Grimshaw, in the eleventh generation of the Oakenshaw line. 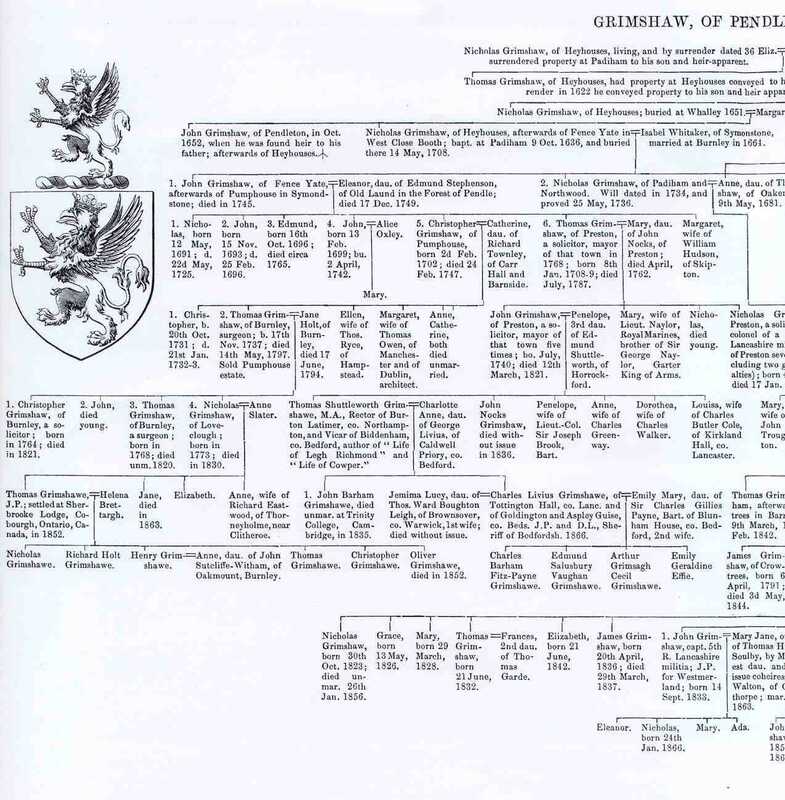 The descendant chart in Whitaker was re-published by Foster3 in somewhat modified form as “Pedigree of Grimshaw, of Pendle Forest, in Whalley Parish, and co. Lancaster,” but no credit was attributed to its source. In September 1877 The Preston Guardian, the principal newspaper of Preston during that time, published a series of four lengthy articles on the Pendle Forest Grimshaws. These articles provide a great deal of highly relevant Grimshaw family history and are provided on a companion webpage. They are best reviewed in conjunction with Whitaker’s descendant chart shown in Figure 1. Thomas Dunham Whitaker has contributed perhaps more than any other individual to the genealogy of the Grimshaw family. 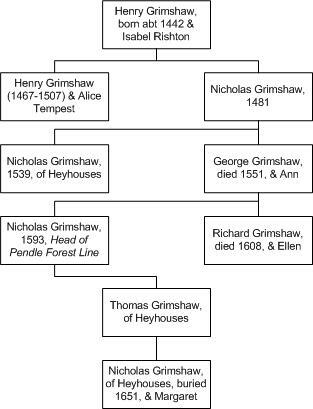 Included in his History of Whalley1 are three Grimshaw descendant charts, starting with that of the earliest recorded Grimshaw family, begun by Walter Grimshaw, who was living AD 1250. This family started in Eccleshill and moved during the fourth generation after Walter to Clayton-le-Moors because of a fortuitous marriage. The descendant chart is referred to on this webpage as the Eccleshill/Clayton-le-Moors (E/ClM) chart. The second descendant chart, for the Pendle Forest Grimshaw line, has Nicholas Grimshaw at the head. However, Whitaker could not, or at least did not, clearly show the connection of the Pendle Forest line to its parent E/ClM line, leaving the many descendants of the Pendle Forest line (and the subsidiary Irish line) of Grimshaws unable to establish clear ties back to Walter Grimshaw at this time. Recent review of two additional publications has now established a clear connection, which is represented diagrammatically below. Additional detail is provided on a companion webpage. A diagram showing the details of the connections, using images Whitaker’s Grimshaw descendant charts, is as follows. Pendle Forest is located about seven miles northeast of Clayton-le-Moors. 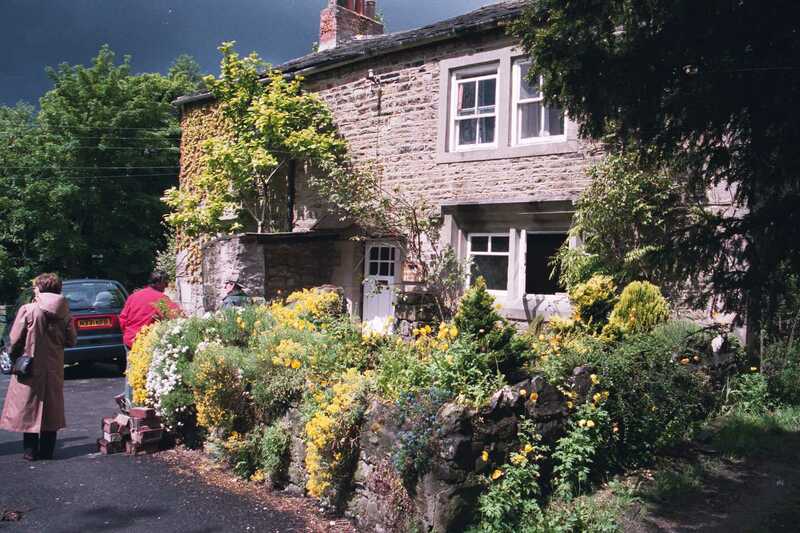 Heyhouses, the location given for Nicholas in the descendant chart, is on Pendle Hill near Sabden. Pendle Hill and Cockshutts Farm, at the Grimshaw location in Heyhouses, are shown below. Another important location is St. Anne’s Church in nearby Fence, where a large monument with Grimshaw inscriptions can be found in the church cemetery. Westward view of Pendle Hill. Heyhouses, the location of Grimshaw settlement in the late 1500s, is on this hill just to the left (south) of this photo. Newchurch, where the alleged Pendle witches came from (see further down on this webpage), is located just to the right of the photo. Photo taken April 1999. One of the most famous “witch cases” in England4 involved individuals from Newchurch, which is less than 3 miles from Heyhouses, where the Pendle Forest Grimshaws began with Nicholas as the progenitor. In the Pendle Witch event, a bizarre sequence of occurrences, including some very questionable trials, resulted in the hanging of seven individuals (6 women and one man) at Lancaster on August 20, 1612. 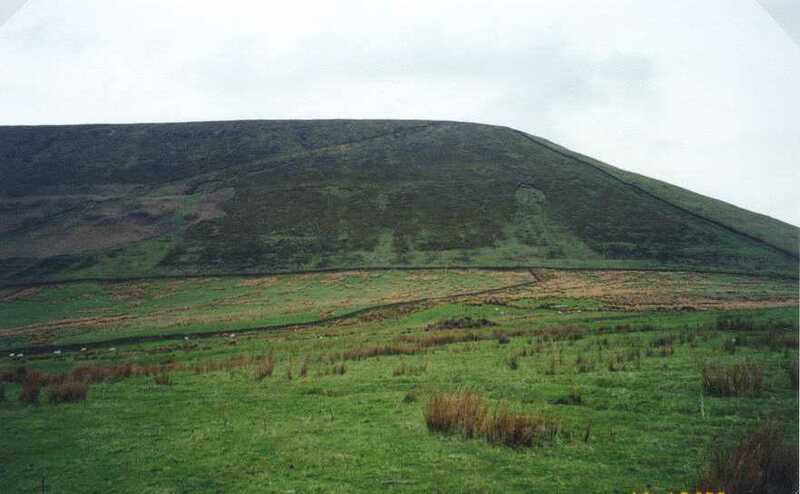 To this date, the Pendle Hill area is known as “witch country”, a reputation that now appears to be capitalized upon for attracting tourists. The earliest date shown for Nicholas is 36 Elizabeth (about 1588), so the Pendle Forest Grimshaws had been living in the area for almost 25 years when the incident occurred. However, no mention is made of any Grimshaws in any of the literature on the event reviewed by the website author. One of the most significant “traces” of the Pendle Forest line is a large monument located in the cemetery at St. Anne’s Church in Fence, a community a few miles east of Pendle Hill. A description and photos of the church and monument are also given on another webpage. The inscriptions on the monument are “connected” to the descendant chart on yet another webpage. Nicholas Grimshaw, sixth generation descendant of the Nicholas Grimshaw at the head of the Pendle Forest line of Grimshaws, was responsible for constructing some 40 cottages (and a Baptist chapel) in Sabden in the late 18th century, when he was a clerk for the Sabden Printing Company. David Eaves, current resident of Sabden, has co-authored a book that includes a number of old photos, dating to 1890-1910, of buildings constructed by Nicholas. David has generously provided images of Nicholas’ buildings as well as a considerable amount of family history for Nicholas and his descendants. The book1, “Sabden, Past & Present, a Photographic History”, is authored by Audrey Barrett and David Eaves and is described on this webpage (below). It is available from the publisher at: Landy Publishing, “Acorns”, 3 Staining Rise, Staining, Blackpool, FY3 0BU, UK. The price is £10.00 sterling, postage free on the UK mainland. Overseas customers should add an additional £3.00 to cover postage. Additional information on this Nicholas Grimshaw and the book on Sabden is provided on a companionwebpage. 3Foster, Joseph, 1873, Pedigrees of the County Families of England, vol. 1  Lancashire: London, Head, Hole & Co., unk. p.
4Bennett, Walter, 1957, The Pendle Witches: The County Borough of Burnley Libraries & Arts Committee (re-published by Lancashire County Books, 1993), 32 p.
Webpage posted July 2000, updated January 2001. Slightly upgraded in July 2008. New banner added July 2015.